In August, the UK Council for Child Internet Safety (UKCCIS) released a guidance document for schools on dealing with ‘Youth Produced Sexual Imagery’ (YPSI) or more commonly known as ‘sexting’. 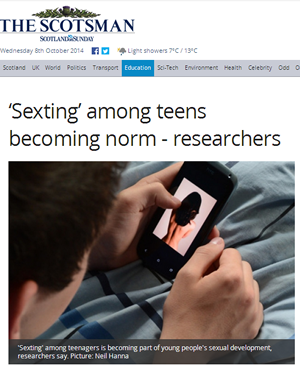 Many children and young people send inappropriate images as they see it as a form of ‘flirting’. Many do not realise that it is against the law to create, send and share indecent images of a person under the age of 18. The danger is that these images will be harnessed by adults and once they are in the possession of unscrupulous individuals, young people could be coerced into sending more images. 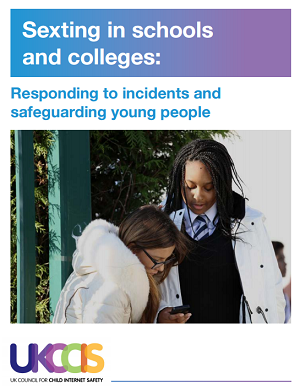 The 61 page document looks at the criteria that schools or colleges need to consider before making a referral to the police or social care about an incident. The guidance has been written in consultation with a number of agencies including the National Police Chiefs Council and Department of Education. The aim of the guidance is to support the Designated Safeguarding Leads(DSL) in their decision making when dealing with a YPSI incident. In recent months a number of police forces have highlighted concerns of schools referring incidents which do not constitute a police investigation. Any YPSI incident in a school should be treated as a safeguarding issue. Schools may respond to a YPSI incident without involving the police. Criminal justice response should only be considered proportionate in certain circumstances. All police forces have a new charging code (‘Outcome 21’) which can be used for YPSI incidents. This new code is intended not to criminalise young people, especially if they are involved in a minor YPSI incident. The reasoning behind this, is that if they want to work with children, it will not show up on a DBS check. In the majority of cases, parents should be informed of their child being involved in a YPSI incident. ALL staff should receive training related to the YPSI guidance. In the vast majority of cases, staff should not view any YPSI images/video and delete them from a young persons smartphone. The guidance offers information for schools on teaching about ‘sexting’ in the curriculum and has links to different resources which can be incorporated into PHSE schemes of work. In addition, there are sample questions that can be used with young people involved in YPSI incidents. The guidance also provides information for schools and colleges on appropriate measures for deleting ‘indecent’ images and ways in which to talk to students involved in a YPSI incident. The guidance is important for primary, secondary and post 16 settings and DSL’s need to look at updating their policies and training staff on the new guidance and should use it in conjunction with the updated ‘Keeping Children Safe In Education’.